Robert Edgar. Photo by Shmuel Thaler. Robert Edgar, professor emeritus of molecular, cell, and developmental biology at the University of California, Santa Cruz, has been elected to the National Academy of Sciences in recognition of his distinguished achievements in original research. Election to the academy is considered one of the highest honors for U.S. scientists and engineers. The academy announced the election of 72 new members on May 1, bringing the total number of active members to 2,025. Edgar is known for significant contributions in two areas of molecular biology--the genetics and self-assembly of viruses and the genetics of a tiny worm, the nematode Caenorhabditis elegans, which Edgar helped establish as one of the most useful model organisms for biological research. As a professor of biology at the California Institute of Technology, Edgar did pioneering research in molecular biology, studying a virus that infects bacteria (known as bacteriophage T4). He received the Molecular Biology Award from the National Academy of Sciences for this work in 1965. In 1970, Edgar came to UC Santa Cruz as founding provost of Kresge College. His primary focus initially was on undergraduate education and the establishment of the new college. But he also continued his research, and he became interested in C. elegans as a model system for studying developmental biology. In 1975, he began publishing The Worm Breeder's Gazette, in which C. elegans researchers shared their ideas and discoveries. The publication played a major role in the development of the community of researchers studying this important organism. 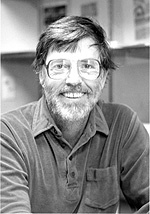 Edgar also had a role in the beginnings of the Human Genome Project as a key participant in the 1985 workshop organized by Robert Sinsheimer, then chancellor of UCSC, to explore the feasibility of sequencing the human genome. The Santa Cruz workshop planted the seed for what later became the International Human Genome Project. A fellow of the American Academy of Arts and Sciences, Edgar earned his bachelor's degree at McGill University in Montreal and Ph.D. in biology at the University of Rochester. Established in 1863, the National Academy of Sciences is an honorific society of distinguished scholars engaged in scientific and engineering research, dedicated to the furtherance of science and technology and to their use for the general welfare.